I kept hearing about them so a quick stop on Feebay and one has arrived. Kind of cool for $15.00 to the front door. Anyone dig them ? Any stories ? I've used a friends for cleaning fish once. Seems like a good knife for the price. $ 15 is hard to beat, depending on model/type I'd buy one for that. What model you get ? Sorry, been away from this site for way too long. I picked up a 860 MG and then a few weeks later another one, for the truck. For the price, they can't be beat. Easy to find on Ebay. I ain't around much myself. Most the cool kids have left. The Companion is a powerful tool for bushcrafters, hunters and outdoor people. A patterned high-friction grip makes the knife pleasant to hold and easy to handle. The classic Scandi grind combined with high quality carbon steel makes the knife easy to resharpen. 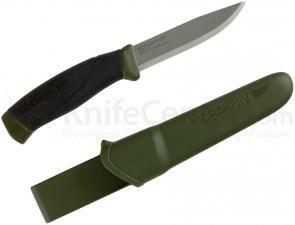 The Companion comes with an OD green composition belt sheath with drain hole. Get a decent knife with decent steel and you will enjoy the edge. There is nothing wrong with Carbon steel, it is how it is heat treated that matters. Shon Rowen does the best on our DPx HEST Original. I need a new EDC knife, I can buy two well regarded knives for $100 less than one Hest folder. They don't have all the bells and whistles but I will eventually end up loosing them over the years anyways . I do have a original Hest fixed blade I use in the woods and my farm. I had a Mora Knif that was given to me by my wife's grandmother (Mormor) who brought it for me from (yup) Mora, Sweden. I loved it, but it was stolen from my van when somebody broke into it years ago in central Mexico. I might have to go to Sweden some day just to get another one. I recently purchased a Cold Steel Scimitar folder for EDC. I was not entirely sure what I'd get but I've been really happy with the quality so far. The knife arrived razor sharp and has held its edge well. I'm thinking about buying some of their other products. Do you guys have any experience with Cold Steel knives good or bad?